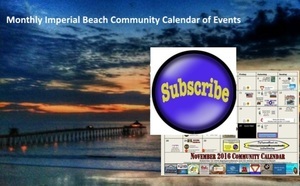 I Love a Clean San Diego's Coastal Cleanup Day - Imperial Beach Veteran's Park Clean-up Day Is Saturday September 16th! 9am to Noon. http://cleanupday.org/cleanupSites.htm#zone5 If you have any questions or need help registering, please call I Love a Clean San Diego at (619) 291-0103 and mention Coastal Clean Up Day. There are currently 27 volunteers registered for this site. From I-5 S, take exit 4 for Coronado Ave. Turn right onto Coronado Ave. Continue onto Imperial Beach Blvd. Turn right onto 8th St. Veteran's Park will be on your right.